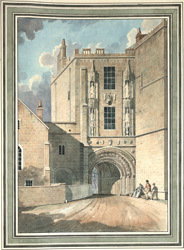 North view of St Augustine's gateway at College Green. The late-Norman arch is decorated with diamond and zig-zag patterns, while the interior of the gateway is rib-vaulted. The columns are also heavy decorated in a style similar to the arch. The upper stories of the gatehouse were rebuilt around 1500 by Abbot Newland.